The lure of folklore lies not in its individuality but rather in its universal appeal. It is a form not confined to a specific culture but for all humanity. What emerged as geetika in Eastern Bengal in the middle ages or further back in time, independently developed as ballads in England, romance in Spain, vise in Denmark, bylina in Russia so and so forth. Yet each of these folklores has a distinct flavour of its own, which is their social influence. Folklores reflect the days and lives of the people, the society they live in, their laughter and sorrows, their grievances and their joys. A group of scholars find ballads as a continuing tradition from the primitive ages. Later, critics have suggested that people were too indefinite, too disorganised for such concerted efforts, and that ballads were composed under the direction of an individual bard who brought the necessary discipline in songs and who functioned as the main organiser and guide. According to the critics, after an individual ballad was composed, it passed on from person to person, community to community through oral traditions. In the process some were changed, improved and sometimes even deteriorated. This individualistic theory has been accepted by the scholars at both home and abroad. The village bard is also known to compose palagaan and jatra. Despite their similar roots, each of these folk media is essentially unique. Open theatre or jatra, and palagaan to some extent is based on action of the protagonists, geetika on the other hand is based on musical plots where the gayen presents the geetika in front of the audience. Tradition in the healthy days of balladry was a constructive, creative process. It was capable of remarking all manner of diverse materials into ballads. This pattern, the essential traits of ballad style, is balladness; the origin of this pattern, not the origin of any individual ballad, is unique in the sense that they remained spontaneous, and spiritual. The thoughts and beliefs of the bards are reflected in their creations. From these geetika we can trace the ever-changing aspects of society. Although a creation of an individual and transmitted orally from generation to generation, almost a millennium that has passed saw refinement of these ballads. Religion had its influence but this is a relatively modern addition. Western ballads came of age during the Renaissance. The time when west emancipated spiritually and intellectually, ballads witnessed a similar incorporation. Strange it may seem, ballads of our culture are known to have undergone a similar incorporation centuries before the renaissance. We were not only as rich in culture as our western counterparts but in terms of balladry, centuries advanced. Women in Mymensinsh geetika have enjoyed a prominent role. Chandravati is one of the three well-known women poets of the medieval period. Chandravati has been immortalised as the heroine of Jay-Chandravati, which tells the story of Chandravati's love for a Brahmin boy, Jaychandra. The two were to get married when Jaychandra rejected her for a Muslim girl. Jaychandra even converted to Islam in order to marry his Muslim sweetheart. Jaychandra soon realized that he still loved Chandravati and tried to return to her. Chandravati, however, rejected her former lover who committed suicide by drowning himself. Chandravati grieved at Jaychandra's death. Among Chandravati's other writings are Padmapurana and Maluya. She is also believed to have written Dasyu Kenaramer Gatha. The geetika of Mymensingh and East Bengal are documented. In recent times, some of the ballads have been dramatised for stage, Madhob Maloncha Konna for instance. It is truly a fascinating experience to witness depiction of our age through plays or ballads written hundred years in the past. This is the appeal of folklore. They are not only ever living but also evergreen. We happened upon a unique birthday party a few years back. The birthday girl in question had just completed her first year, and to celebrate this milestone, her parents had arranged for a puppet show. Children and adults alike laughed and sang along as we watched how Dadu bhai taught the naughty cow a lesson, or how the fox outfoxed the hunter, and more. For a short while, all worries were forgotten as we got lost in another reality. They come in various shapes and sizes. Each has a distinct identity, an individual personality. Like you and I, they smile and cry, and sing and dance, drawing us into their colourful worlds and their fables, and we walk away from them with a lesson learnt. 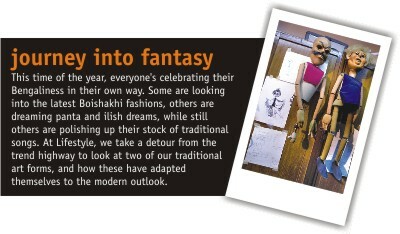 In the hands of a master, the puppets of wood and clay come to life, presenting a world we fancy. The foreign influence on putul nach, as it is known traditionally, has not only corrupted the form, but also resulted in near extinction of the sophisticated form of performing art it once was. The earliest recorded evidence of puppetry in this region comes from the ancient text of Mahabharat. The practice is however believed to be much older, a good thousand years before the birth of Christ. Some scholars opine that puppetry had evolved across the globe independently, while others opt for the view that it had reached Europe from India and the Orient. Controversies apart, the universal acceptability of puppets as a form to express human emotions and life in general, speaks volumes for the craft as a form of art. For eons, puppets have been used in the depiction of ethos of the eastern Bengal. The use of bamboo puppets flourished in this region over the millennia. Three-string puppets had their days of glory but have been largely overshadowed by their 'bamboo' cousins, and more recently by rod puppets. In the past, these 'wooden' figures had a social voice, a political air and a matured audience. Breaking the boundaries of age and time, puppetry has now reached children and has opened for them a new horizon where dreams and fantasy come into tangible, visual form. Modern puppetry may be called puppet theatre while the traditional puppetry is <>puppet-jatra<>, the rural drama form of ancient Bengal. In the early period of puppetry, puppets were only made to dance. Later on drama was added. It can thus be concluded that puppet theatre is a relatively modern form. The folk culture of our country, including puppetry is colourful and matured. As a form of art, it is rich in visual terms, and also in terms of the themes it portrayed. The educational value of this art form is also apparent in ventures like the highly successful Sisimpur series, which is a Bangladeshi adaptation of the ever popular Sesame Street programme, targeting children within the age group of 3-6. With a curriculum defined by Bangladeshi educators, the series emphasizes not only literacy, math and science, but also helps foster values such as self-respect, empathy and cooperation. With a view to reaching a nationwide audience, other key objectives of this show include improving educational opportunities for young girls; promoting good nutrition, hygiene and safety; and encouraging appreciation of the shared cultural heritage of diverse segments of Bangladeshi society. The series debuted in April 2005 on BTV, and currently airs four days a week. Initial development and production were made possible by a grant from the United States Agency for International Development. The series is produced in partnership with Nayantara Communications. In the world of puppetry, we find only friends. The demon of puppet theatre is as lovable as the young princess; the herb chewing bull is a chum of the village Bard, despite the fact that the baul refuses to acknowledge their kinship, and leave no stone unturned to have a laugh at the bull. Even to the youngest of audiences, puppetry has proved to be a great tool for promoting essential messages and information. 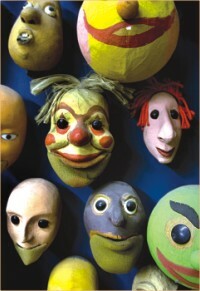 Children with learning impairments have also been observed to respond well to puppets. Puppetry has evolved over time in Bangladesh. Through people like Mustafa Monwar, our tradition has found new dimensions, and an audience in children. Elsewhere around the world, people are waking up to the potentials of this art form in the sphere of adult education. People are making their own puppets, creating new characters, and exploring new creative outlets. The time has come when we too, should attempt to go back into our history and roots in search of a medium as effective to little children as it is to adults. Our sincere thanks to Mustafa Monwar for helping us with the write-up and allowing us to use his studio for the photo shoot.